School counselors play a valuable role in public and private schools across the country. Some school counselors evaluate students for learning or mental health issues, helping them cope with social or behavioral problems. Others specialize in career planning by working with high school and college students to map out their professional pathway. Counselors also meet regularly with teachers, administrative staff, and parents to discuss the welfare of individual students. A master's degree is typically the minimum educational requirement for most school counseling positions. An online master’s in school counseling program allows you to complete course requirements without disrupting your current professional obligations. Designed to mirror the curriculum found in a traditional campus format, online programs cover the current tools and techniques used by counselors, the latest research in the field, and other fundamentals of school counseling. As a distance learner, you may have the opportunity to concentrate your studies on a particular age group and complete supervised internships at a local school. Only you can properly evaluate whether a school’s strengths match your educational needs. The following ranked list of schools should be a helpful starting point in your search for the best online master’s of school counseling programs. If you're interested in a particular program, consider contacting that school's admissions specialists to learn more about specific application requirements and course offerings. Based in Nashville, TN, Vanderbilt is a prestigious private college that offers some of the top distance education programs in the country, including an online master's in school counseling. The master of education in human development counseling with a specialization in school counseling is a 2-3 year program that builds comprehensive knowledge in social and behavioral sciences. The curriculum prepares graduates to serve the social, emotional, psychological, and academic needs of K-12 students. The program focuses on several key study areas, including social and cultural diversity, human growth, helping relationships, research and assessment, and ethical practice. Courses occur primarily online, with weekly synchronous meetings that include group discussions and guided learning activities. The program curriculum requires 48 credits total, divided between 42 credits of required courses and six credits of electives. The program core covers topics such as developmental counseling psychology and counseling diverse populations. Electives offer the chance to explore specialized topics such as cognitive behavioral therapy in practice and counseling for college access and admission. All distance learners must attend two immersion sessions on the Vanderbilt campus in Nashville. These sessions bring students and faculty together for hands-on learning activities and collaborative projects. Degree candidates must also complete three terms of field experiences, including an internship and practicum. These required field experiences offer the chance to apply theoretical coursework to a professional educational environment. Online students typically perform work at organizations in their own community. Most students complete their field experience at public schools or charter schools. Wake Forest is a private college located in Winston-Salem, NC. The school serves around 7,400 students annually through its main campus and its distance education program designed for working professionals. Wake Forest offers one of the top online master's in school counseling programs in the region, with a clinical and theoretical curriculum that stresses human growth and development, social and cultural relationships, and research and program evaluation. Students benefit from a fully online format that features significant support services, including counseling, technical support, and online tutoring. Graduates of Wake Forest's CACREP-accredited counseling program boast a 98% pass rate on the industry-standard national counselor exam, a rate higher than the national average. The degree requires a minimum of 60 credits, including 12 credits of foundational courses, 18 credits of core courses, and 30 credits of school counseling specialty courses. Foundational courses introduce key concepts such as lifespan development and research/statistical analysis in counseling. The program core delves into more advanced topics while still maintaining a generalized focus, with courses such as family counseling and group procedures in counseling. The 30 credit counseling specialization core includes an eight-credit beginning practice section — which introduces major school counseling topics — and 22 credits of advanced practice, which moves into high-level topics such as addiction counseling. As part of the overall curriculum, candidates complete a three-credit practicum and a six-credit internship, both of which build professional skills in an approved school counseling environment. The practicum occurs earlier in the program and requires candidates to complete 165 hours in one semester, while the internship requires 300 hours over the course of two semesters. A private college based in the heart of New York City, NYU Steinhardt offers a comprehensive master of arts in counseling and guidance with a concentration in school counseling. This primarily online degree places school counseling in a framework of equity and social justice, training counselors to provide support to individuals and groups. NYU Steinhardt also offers an optional concentration in bilingual counseling, which focuses on multicultural theory and trains counselors to work with culturally and linguistically diverse students. Both program pathways prepare graduates for PK–12 school counselor certification in New York. The curriculum may meet certification requirements for other states, though students outside of New York are responsible for determining individual state requirements. NYU Steinhardt's online master's in school counseling offers three start dates in January, June, and September. Depending on start date and course load, students can complete the degree in as few as 18 months. Courses rely on a synchronous format that features live weekly class meetings and interactive counseling labs. While most coursework occurs online, students must attend one immersion session held at the NYU Steinhardt campus in New York City. The immersion experience offers students the chance to practice counseling work under faculty supervision, observe and participate in group therapy sessions, and a variety of other learning activities. In addition to online coursework and the immersion session, the counseling program requires candidates to complete 100 hours of practicum experience and 600 hours of internship experience. These field placements typically occur at approved public or private schools within a student's home community. Located in the eastern Pennsylvania city of Bethlehem, Lehigh serves a student body of nearly 7,000 and ranks among the top private colleges in the state. The school offers an assortment of respected distance education programs, including a master of education in international school counseling. This unique program focuses on strategies for counseling in the international education environment, with a curriculum that targets three major areas: the family, the community, and the school. Counselors gain skills for best practice intervention and explore counseling from developmental, preventative, and culturally therapeutic perspectives. The program's curriculum examines the experience of students and families abroad, preparing graduates to serve as counselors in overseas schools and related settings. Candidates pursuing the master of education in guidance and counseling online complete a total of 36 credits, which typically requires two years of study. The program uses a hybrid format that mixes online courses with in-person sessions held during the summer. Online courses feature a mixture of synchronous and asynchronous coursework, with some required class meetings held at designated times. Lehigh's in-person summer institute sessions bookend the program's first year, occurring the summer before and after the regular school year. During odd-numbered years, the summer institute occurs at the Leigh campus in Pennsylvania; during even-numbered years, it occurs in Greece as part of an international immersion experience. Both sessions offer students the chance to meet with peers and faculty, perform hands-on learning activities, and apply theoretical coursework to supervised counseling practice. Along with the summer institute, students also complete in-person internship activities in their own community. The largest college in Missouri, Mizzou enrolls more than 30,000 students annually. The school offers a large selection of online programs, including a master of education in educational, school, and counseling psychology with an emphasis in mental health practices in schools. The program typically takes about two years to complete and uses a fully online format with no required campus visits. Mizzou offers in-state tuition to all online students regardless of state residency. However, out-of-state students should check with the school to determine their eligibility for online study based on state restrictions. 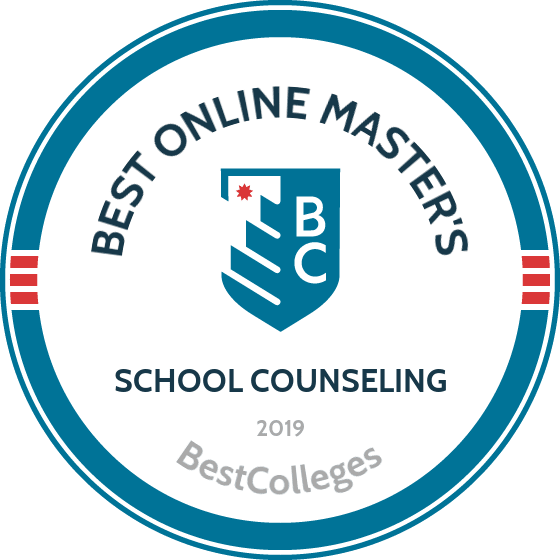 The online master's in school counseling does not confer school counseling certification or counseling licensure, though many graduates go on to receive certification after completing the degree. The master's in education counseling online program requires a minimum of 34 credits, divided between a 25 credit program core and nine credits of electives. The program core builds key skills in counseling theory and practice through courses such as developmental aspects of human learning, diversity issues in school mental health, and communication and collaboration with children and families. Electives offer specialized knowledge in a wide assortment of counseling topics. Mizzou offers more than a dozen elective options, including bully and youth violence prevention and reduction and building resiliency and optimism in youth. Students can apply credit from counseling electives toward Mizzou's optional graduate certificate in multicultural education. These courses include immigrant issues in education and historic and current issues in African-American education. Based in Lynchburg, VA, Liberty offers its more than 94,000 online students an assortment of professional, academic, and artistic degrees at all levels. This includes one of the top master of education in school counseling online programs for Christian students. Preparing graduates to serve in counseling positions in both Christian and public schools, the degree focuses on counseling techniques, psychological theories, professional ethics, and career guidance. Counselors gain the skills to devise, develop, implement, and evaluate counseling programs and initiatives in a variety of education environments. Counseling candidates learn how to help students meet academic, social, personal, and professional goals. Liberty also offers flexible enrollment options and multiple yearly start dates to accommodate working students. Liberty's counseling degree requires 48 credits total and takes two years to complete on average. Some of the program's required courses include child and adolescent counseling in the schools, career development and counseling, and school counseling program development and evaluation. All candidates also complete a six-credit internship experience that connects coursework to observation activities and professional practice in an approved education environment. While most coursework occurs online, the program does require some campus intensives held in Lynchburg. These campus sessions typically feature one-week immersions during which students can interact with peers and professors, complete hands-on counseling activities, and network with other counseling professionals. Intensive sessions also occur in weekend-based formats to accommodate working professionals. A private Lutheran college based in Mequon, WI, CUW is a member of the extensive Concordia University System, which operates campuses around the country. The school hosts a sizeable distance education program, including an online master of science in education in school and professional counseling. Integrating methods of evidence-based practice with an array of counseling theories and intervention strategies, the program trains counselors to adhere to ethical and professional standards while serving diverse student populations. CUW's counseling curriculum meets standards set by both the Wisconsin Department of Safety and Professional Services and the Wisconsin Department of Public Instruction, preparing graduates for school counselor (K-12) licensure. CUW's online master's in school counseling requires 45-48 credits, depending on professional background. Students who lack teaching licensure, for instance, must take one additional course in management for counselors. All candidates must complete at least one course in each of the program's 10 major subject areas, which include counseling theory, social and cultural foundations, helping relationships, career and lifestyle development, and supervised practicum and portfolio. All candidates complete a two-credit practicum experience in an education environment and submit a portfolio that demonstrates mastery of the State of Wisconsin's pupil service standard for school counselors. CUW also maintains a unique community partnership program that works with school districts and individual schools around Wisconsin to provide professional development opportunities for educators. Through the community partnership, counselors at eligible schools can receive discounted tuition and customized instruction to meet their institution's unique needs. Interested counselors should consult their employer or CUW to determine eligibility for the partnership program. A private interdenominational college located in Hobbs, NM, USW hosts a distance education program that includes one of the top master's in education in counseling online programs in the Southwest. This comprehensive degree examines the relationship between students and their educational environment, focusing specifically on reducing institutional barriers that restrict student success. USW offers a fully online format that requires no campus visits. Most courses use an asynchronous delivery mode, making it easy for students to complete coursework on their own weekly schedule. The program also prepares graduates for New Mexico state school counselor licensure. USW does admit out-of-state students, but applicants should check with their state's department of education to determine if the program curriculum meets local licensing and certification requirements. The master of science in education in school counseling degree requires 42 credits total, including a 12-credit program core, a 24-credit major requirements section, and a six-credit elective section. The core section builds foundational skills for advanced study and includes topics in counseling research, theories, techniques, and ethics. Students choose from several specialized elective courses that explore topics such as human sexuality, play therapy, and addictions counseling. The major requirements section forms the majority of the curriculum and covers a broad selection of topics, including psychoeducational assessment, career development, and crisis and trauma intervention. This section also includes nine credits of internships and practicum experiences, which students complete under close supervision at private or public K-12 schools. A private Roman Catholic college, Seton Hall serves more than 10,000 students from its campus in South Orange, NJ. The school also operates a significant online program that includes a master of arts in school counseling. This fully online degree prepares graduates to provide competent counseling to socially, ethnically, and geographically diverse student populations in K-12 schools. The program emphasizes the varied roles that counselors perform, including leader, consultant, collaborator, and advocate. Designed according to CACREP standards, the program also meets the New Jersey Department of Education's credentialing requirements, preparing graduates for school counselor certification. The master's in education counseling online uses a cohort format that enables students to complete most courses together as a group. Most degree candidates complete the program in two to two-and-a-half years. The 48-credit program curriculum includes a counseling core along with supplementary sections that cover key areas in assessment, psychological foundations, sociological foundations, research, and professional orientation. The 15-credit program core explores foundational topics such as abnormal psychology, group counseling, and counseling theories. Additional program sections examine different aspects of the field in greater depth; the sociological section, for example, includes courses in multicultural counseling and counseling with community agencies. All candidates also complete nine credits of supervised experience, which consists of a three-credit practicum and a six-credit internship. The practicum takes place earlier in the program, while the internship serves as a culminating experience, stretching across two academic terms. Distance learners typically perform supervised experiences at an approved education setting near their community. A private Jesuit college located near downtown Omaha, NE, Creighton offers one of the top online master's in school counseling programs in the state. The school's master of science in school counseling and preventive mental health explores child and adolescent development in the context of effective counseling and leadership, and trains counselors to assist students in public and private schools. The program offers three specialization options: elementary school counseling, secondary school counseling, and PK-12 guidance counseling. The program curriculum also meets all requirements for Nebraska state counseling certification. Creighton enrolls online students from around the country, but applicants who reside outside of Nebraska should check with their state education board to determine if the counseling program meets individual state certification requirements. The degree requires 36-39 credits, depending on concentration track. Students in the PK-12 guidance counseling pathway must take one additional course. All candidates complete both a required program core and specialization courses. The counseling core includes 15 courses that cover a wide variety of topics, including career perspectives for children and adolescents, action research in school counseling, and social justice and diversity in school counseling. Each specialization track requires three courses: an education issues course and two internships. The PK-12 track, however, requires students to complete education issues courses for both elementary and secondary education. Regardless of concentration track, students complete 600 internship hours in an approved education setting. Degree candidates without teaching certification must also complete two practicum courses and two additional education courses in school culture and curriculum, instruction, and assessment. A private, Baptist-affiliated college based in Williamsburg, KY, UC enrolls more than 7,000 students annually, offering both campus-based and online degrees fixed in a framework of Christian values. The school hosts one of the top master of education in school counseling online programs in the region, training counselors to serve as leaders and facilitators for student success. Graduates are prepared to serve as school counselors for both religious and secular K-12 schools. Degree candidates complete 45 credits total, spread across 16 courses. The program curriculum introduces major topics in counseling, such as psychological assessments and research methods in education, as well as more specialized courses, such as introduction to addiction counseling and counseling individuals with diverse needs. The degree includes both a practicum and an internship, offering students the opportunity to apply their course learning to hands-on counseling practice. The practicum occurs first, introducing candidates to direct counseling under close supervision. The internship occurs as the program's culminating experience, creating a bridge between graduate education and professional practice. The master of education with a concentration in school counseling does not lead to teaching licensure, but it does prepare graduates for school counseling certification. UC accepts out-of-state online students, and the counseling curriculum qualifies for school counselor licensure in many states outside of Kentucky. However, students should check with their state certification office to ensure that the degree qualifies, as some states (including Minnesota and Iowa) evaluate transfer certification on a case-by-case basis. Standardized tests: GRE or MAT scores required for unlicensed applicants. Serving a student body of around 5,000, UWA operates a main campus in Livingston and an extensive distance education program. The school's master of education in school counseling online trains counselors to practice advocacy, assessment, and evaluation in public and private K-12 schools. UWA offers convenient eight-week courses and multiple start dates throughout the year to create maximum flexibility for working students. With full-time study, most candidates complete the degree in just one year. While the program leads to Alabama state teaching certification, out-of-state students should note that the degree curriculum may not meet requirements for school counselor certification in all states. Applicants outside of Alabama should research individual state requirements before enrolling in the program. Degree candidates complete a minimum of 48 credits, divided between nine credits of professional courses and 39 credits of certification area courses. The professional core includes three general courses that build a foundation for further study: techniques of educational research, educational statistics, and either advanced educational psychology or lifespan development and learning. The certification section delves into major topics in counseling, including topics in diagnostic techniques, multicultural counseling, group counseling, and strategies for crisis intervention. All candidates complete a three-credit practicum and a two-part, six-credit internship in counseling. These field experiences enable students to develop their own counseling practice under close supervision in a variety of educational settings. Online learners typically complete their practicum and internship at a school within their community. Founded in 1883, the University of North Dakota predates the state of North Dakota by six years. With its main campus in Grand Forks, North Dakota, UND serves nearly 14,000 students, with 3,500 enrolled entirely online and another 3,000 taking at least one online course. One of UND's leading academic programs is the MA in counseling - K-12 school counseling emphasis program. This 60-credit online masters in school counseling program only takes 2.5 years to complete and coursework is specifically designed to help students obtain licensure to become K-12 counselors. The program is accredited by the Council for Accreditation of Educator Preparation. Classes in the K-12 counseling program include child and adolescent counseling, career counseling, and educational collaboration. Students learn from faculty who have practical experience working in child and adolescent care across a variety of settings. School counselors enjoy a 13% job growth rate, which means UND's online MA in early childhood education will prepare you for a successful, stable career working with children. The University of Massachusetts is a private research university first established in 1839. Its Boston branch serves 16,000 students on its waterfront campus, featuring a 16-to-1 student-to-teacher ratio. With 10 colleges offering 77 undergraduate and 130 graduate programs, UMass Boston has something for everybody. UMass Boston offers both on-campus and online programs, allowing students to choose the education style that is best suited to their needs. One of the schools mostly online programs is the M.Ed. in school counseling degree, which includes two clinical courses held in person at the University of Dartmouth campus during the first week of summer. The 60-credit degree also requires an internship, which can be completed in schools local to students with online supervision from UMass Boston faculty. Course listings include professional, ethical, and legal issues in school counseling; psychopathology and diagnosis; college readiness counseling; and child and adolescent counseling. UMass Boston is accredited by the New England Association of Schools and Colleges, and admission to the mental health and school counseling program requires a bachelor's degree, a minimum undergraduate 3.0 GPA, a GRE score, and at least one year of human services experience, which can include volunteer or internship experience. Applications also require a personal statement, 2-3 letters of recommendation, and an application fee. As the name implies, Emporia State University is based out of Emporia, Kansas, where it was founded in 1863. ESU's school counseling program was established in 1947, and since then it has prepared more school counselors than any other college in Kansas. ESU offers a variety of counseling programs online, including a master of education guidance and counseling online. ESU's online school counseling master's program is an excellent choice for working professionals or parents who must schedule their education around other responsibilities. However, the program isn't fully online. About half of the courses must be taken on grounds at ESU or at its Overland Park campus. The program is approximately 48 credits and takes the average student 2.5-3 years to complete. Program courses include multicultural counseling, analysis of research, leadership and advocacy, and psychosocial development and disability. Program admissions require applicants to submit an assortment of departmental forms, and to undergo a personal interview with the program's faculty. ESU's master of school counseling program is accredited by the North Central Association, the National Council for Accreditation of Teacher Education, the Kansas State Department of Education, and the Council for the Accreditation of Counseling and Related Educational Programs. With students from all 50 U.S. states and over 100 countries, Oregon State University offers a diverse learning environment. Founded in 1868 as Corvallis College, OSU is primarily a research university, attracting annual grants totaling $441 million — more than any other university in Oregon. Among OSU's countless programs is the master of counseling - school concentration degree, which serves students pursuing careers as school counselors. This 75-credit program is offered in a hybrid format to accommodate busy student schedules. About half of its classes are online, with the other half held on OSU's campus for two weekends per term. The course catalogue includes addictive behavior counseling, developmental perspectives in counseling, cross-cultural counseling, special education issues, and appraisal of the individual. During the second and third year, students must take online practicum classes alongside internships, which prepare students for the practical realities of life as a school counselor. OSU's online masters in school counseling program is accredited by the Council for Accreditation of Counseling and Related Educational Programs, the National Council for Accreditation of Teacher Education, and the Oregon's Teacher Standards and Practices Commission. Established in 1931, ULM is a public university that has evolved to meet changing student needs with its online nursing and education programs. Its online MS in counseling - school counseling track is focused on supporting a diverse student body in preparing to become school counselors. LMU's counseling program graduates have the appropriate skills and knowledge to assist students with life obstacles and developmental issues. This field deals primarily with children and adolescents, so it is imperative that counseling students understand the intricacies of childhood development. At ULM, the school counseling master's track requires six semester hours of internship credits, including 600 hours of documented clinical work, to ensure that graduates are prepared for the practicalities of work as school counselors. ULM's MS in school counseling program is accredited by the Council for Accreditation of Counseling and Related Educational Programs. Possible career options for graduates include becoming a school counselor, school administrator, career counselor, vocational counselor, consultant, or higher education counselor. Coursework is offered in eight-week sessions and the program requires 30-39 credits in order to graduate. Incoming students must have a bachelor's degree with a minimum 3.0 GPA, a GRE score, and at least three recommendation forms from previous supervisors or teachers. The admissions process also includes an interview, and there is an application fee. Established in 1950 in Dobbs Ferry, just north of New York City, Mercy College is a private nonprofit university that offers more than 90 undergraduate and graduate programs across five academic schools: business, education, health and natural sciences, liberal arts, and social and behavioral science, which includes an MS in counseling program. School counseling is a fast-growing field, with a projected 13% growth rate by 2026, so career outlook is good for graduates of this 48-credit program. Mercy's MS in counseling program is offered both online and on campus and takes the average student 2.5-3 years to complete. Both programs are offered in full-time and part-time formats to accommodate student needs. The overall goal of this online masters in school counseling program is to prepare students to become efficient school counselors through courses like human development, counseling and ethics, research methodology, and multicultural perspectives in counseling. The program also includes a practicum, which requires a two-course supervised internship in a bilingual school setting. Graduates qualify to apply for certification in New York state to become certified school counselors. Mercy is accredited by the Middle States Commission on Higher Education and the National Association of School Psychologists. Accreditation reassures students that their educational programs are up to national and industry standards. Established in 1928, Angelo State University in west Texas offers over 100 majors and concentrations across its six colleges, including several online courses. Among those programs is the M.Ed. in guidance and counseling degree, which is offered entirely online. For students seeking a counseling career, this 36-credit program can help; classes last 8 weeks and students can finish their degree in two years. Graduates are eligible to sit for the Professional Certificate for School Counselors exam. Subjects covered in ASU's counseling M.Ed. program include career and occupational counseling, tests and measurements, social and cultural influences, theories of counseling, and dysfunctional behavior. School counselor certification requires two additional electives: role of the school counselor, and practicum in school counseling. Students must also complete a comprehensive program review before graduation. GRE test scores are not a requirement for admission to ASU's master's programs, but candidates must submit official transcripts for a bachelor's degree with a minimum 2.75 GPA. To become certified as a school counselor in the state of Texas, students must also have a valid state teaching certificate and two years of prior teaching experience. Established in 1927, UT Martin is the home of UT Online — the University of Tennessee system's online program for both graduate and undergraduate education. One of its many online programs is the MS in education in school counseling program, which prepares students for licensure and helps them narrow down their interests. While this 48-credit program is mostly online, it does require a three day on-campus residency. Some courses students can expect to take while pursuing this program include social and cultural diversity, helping relationships, group work, and human growth and development. Unlike most master of education in school counseling online programs, UT Martin's counseling degree does not require a GRE score or previous teaching experience, though students without teaching experience must enroll in a semester-long orientation course in a K-12 school. Admissions do require a personal essay, a resume, and a minimum undergraduate 2.5 GPA or higher. UT Martin is accredited by the Southern Association of Colleges and Schools Commission on Colleges, and its master's in school counseling program is accredited by the National Council for Accreditation of Teacher Education. It is also seeking CACREP accreditation. Established more than 150 years ago, Gallaudet University is the only university in the world specifically designed for deaf and hard of hearing students. It is a private research university with a diverse student body, including students from more than 25 countries, and it also serves as the world's largest publisher of books about and for the deaf community. Among the many programs and opportunities Gallaudet University has to offer is its MA in school counseling degree. Students usually take three years to complete this program, which is designed to encourage multicultural knowledge and interpersonal skills. Graduates are well equipped to help children and adolescents develop happy, healthy lives. The program is offered in a hybrid format, with students taking online courses for six regular semesters while attending on-campus courses in the summer. The program is about 63 credits, which includes a required 12-credit internship. Upon completing course requirements, students will be eligible to sit for the National Counselor Exam. Applicants to the program must have a bachelor's degree with an undergraduate GPA of 3.0 or higher, three letters of recommendation, and at least two years of work experience, and must also undergo a program interview. Gallaudet University's MA in school counseling program is accredited by the Council for Accreditation of Counseling and Related Educational Programs and is part of Gallaudet's Educator Preparation Provider Unit, which is accredited by the Council for the Accreditation of Educator Preparation. Based out of Hays, Kansas, FHSU is a public university first established in 1902 that now serves 15,000 students. Its tuition rates are the lowest in the Kansas Board of Regents system, and it offers online courses to students across the world through its Virtual College. Among FHSU's online programs is the master of science in counseling - school counseling degree. This 48-credit program helps students seeking a school specialist license in the state of Kansas. To qualify for licensure, students must complete the master's program with a minimum 3.25 GPA, write a research paper, and pass a comprehensive final exam. FHSU allows up to six years to complete the program, which students can take in an online or hybrid format. FHSU is regionally accredited by the Higher Learning Commission. Admissions requirements include a minimum 2.5 GPA earned in a bachelor's degree program, official transcripts from previous schools, an MAT or GRE score, and a personal statement of goals. SAGU is the result of three different Bible schools — Southwestern Bible School, Shield of Faith Bible School, and Southern Bible Institute — merging in 1943 under the common goal of promoting education and Christian faith. Located in Waxahachie, Texas, the school offers a wide range of programs both online and on campus. The M.Ed. in school counseling is one such offering. SAGU applies a Christian worldview to all of their course offerings. Christian-identifying students interested in careers guiding children through the emotional, physical, intellectual, and social turmoil that arises in developing years are ideal for this program. SAGU is accredited by the Southern Association of Colleges and Schools Commission on Colleges, and offers associate, bachelor's, master's, and doctoral degrees. With over 40 academic programs, GMercyU provides its students with many opportunities, whether they are taking traditional classes on its 314-acre campus near Philadelphia or studying online. One of 17 Sisters of Mercy colleges, GMercyU serves 2,700 students and boasts an 11-to-1 student-to-teacher ratio. Among its many programs, GMercyU offers an MS in school counseling program, which educates students on the development of children and adolescents as they move through K-12 educational institutions. The curriculum is tailored to students seeking careers as school counselors. While much of the program can be done online, it also requires two weekend residencies where students gain practical fieldwork experience. To apply to the program, students must obtain a bachelor's degree from an accredited institution with a 3.0 minimum GPA, take six mandatory prerequisite courses, submit a personal statement and at least two letters of recommendation, and attend a personal interview with program staff. The total program takes 60 credit plus an additional 600 hours of supervised internship experience. GMercyU is accredited by the Middle States Commission on Higher Education. Originally established in 1772, Salem College is one of the oldest educational institutions in America founded by and for women. Located in Winston-Salem, North Carolina, it's now among a private liberal arts college with an array of academic programs. One such program is the M.Ed. in school counseling degree, which is a research-driven program where students and working professionals can learn to help children, adolescents, and young adults struggling with developmental obstacles and other life challenges. Course listings include counseling, leadership, theory, and practice; managing the comprehensive school counseling program; and ethics and legalities in education for school counseling. Though the program can be completed mostly online, students must attend two on-campus weekend seminars and complete an internship. The program usually takes 36 months, and applicants must have a minimum 3.0 GPA, submit references and writing samples, and undergo a criminal background check. Once students complete degree requirements and pass the PRAXIS II Specialty Area Test in Professional School Counseling, they will be eligible for licensure as a school counselor in North Carolina. Salem College is accredited by the Southern Association of Colleges and Schools Commission on Colleges. Nikki Specht is a certified K-12 school counselor at a high school outside of Philadelphia. She has a degree in English and communications from Penn State University and a master of education in school counseling from West Chester University. Nikki volunteers at a grief center for children, is a certified grief group facilitator, and volunteers for Red Cross Disaster Mental Health. Why did you choose to earn a master's degree in school counseling? Was this something that always interested you? I never knew I wanted to be a school counselor until just before applying to grad school. I graduated from undergrad at Penn State with a degree in English and communications and worked in marketing for a year before realizing that it was not for me. I had actually applied to grad school to become a study abroad advisor but, shortly before I was slated to begin, my sister died after a long battle with mental illness. After she died, I realized I really wanted to work with students who were struggling with mental health, and wanted to work in a field where I could really help others, and hopefully help students heal and find success in a way my sister could not. As soon as I started grad school, I knew it was the perfect job and program for me. I am able to use my past experiences to connect with kids and families, and it is extremely rewarding every day. What are some of the most crucial skills you gained in your master's degree program that apply to your job on a day-to-day basis? Many people don't know this, but the primary topic we study in grad school is mental health. We do study things like child development, legal and ethical issues, and working with students who are English language learners and special needs. The main focus, however, is around different types of mental illness and how to spot warning signs that a student might need help, followed by learning how to work with these specific students and families. I would say the biggest skills that I learned in grad school are how to listen to students and empathize with them -- I thought this was something I was naturally good at, but there are real skills involved in this that may not be as obvious as they seem. Teenagers and kids have different cognitive functioning and different ways of seeing the world -- so, it really helps to be aware of where the student's mindset is and making sure you're able to meet them where they are. The other skill I utilize every day is de-escalation techniques. You quickly learn that, as the school counselor, you're the person they call when no one else knows what to do. So if a student is crying, screaming, hiding, or otherwise on the verge of a breakdown, you are expected to step in and help that student. Grad school taught me the skills to not only be able to handle those situations, but to feel confident when entering those situations that I would actually be able to help and de-escalate the student back into a more stable condition. What was the job search like after completing your degree? Did you feel fully prepared when making the transition from school into the workplace? I believe that I felt as prepared as possible when leaving grad school. If your school is CACREP certified (something you want to look for! ), they will require you to do 700 hours of fieldwork. As much as my classes were helpful, it's amazing what you learn during your fieldwork. You can talk all day about how to de-escalate a situation, but until you are brought into an active crisis at school you don't know exactly how it'll feel or how you will handle it. Other situations, such as dealing with a conflict between a student and a teacher, talking to angry parents, and running a 504 accommodation meeting, can only be taught with experience, and if you have a good internship placement you should be exposed to all of that before you have to do it on your own. The only area that I feel was lacking in grad school was learning about college counseling. As a high school counselor, this is a huge part of my job, and we didn't get a ton of education in this area so I did a lot of research and taught a lot of it [to] myself, and [learned it] in talking to admission reps. Overall, though, I felt that the combination of my classes and field work in grad school very much prepared me for life on the job. As for the job search, it can be brutal, which is why it is so important to take your internships VERY seriously. These could be the people hiring you one day, or passing your name on to other schools to hire. I interned at my old high school for my final internship, then ended up in a long-term sub position to finish out the year after I graduated. At the end of the year, the counselor I was subbing for was returning and I had no job in sight. Luckily, a former teacher at my school was now an assistant principal at another area high school and emailed around asking if anyone had a good school counseling candidate. Because I took my internship and LTS placements so seriously and worked really hard, they recommended me to the assistant principal, and -- after three rounds of interviews -- I was hired with a contract at that high school. In Pennsylvania, it's very difficult to find a contract in education right now, but in other states it might be much easier if they need good educators. But as long as you work hard and make good connections, you'll find a job that fits. What are some of the challenges you face in your day-to-day work? School counseling is an amazing job with a lot of great things. However, it is not without its challenges. One challenge that we face daily is advocating for students. While everyone in the school wants what is best for the student, my ideas might not always align with that of the teachers, parents, administrators, or even of the student. It can also be difficult trying to reach students who don't want help. There are always kids who show up to school but continue to make poor choices, and they don't want anything to do with the counseling office. It can be difficult to try many different paths to help a student who simply does not want to be helped. It can also be very difficult to see students in distress and in difficult or sad situations. Students will tell us almost anything, including sad stories from home, friendships, relationships, and so on. It's difficult to watch kids who are going through an impossible time in their lives, and though you can be an ear to listen, you can't always change difficult circumstances, especially when they are coming from a difficult home life. The last challenge that we face is any kind of crisis. We often get students who are feeling suicidal or just very depressed. It can be difficult and painful to navigate these situations, working with the parents and students during a very tough time in their lives. Why did you choose to work with high school students? As much as I loved my elementary school internship, I found much more joy and purpose working with high school students. I am able to connect with them and forge really positive and strong working relationships, and the students are able to advocate for themselves and tell us what they need. Students at this age are often at a crossroads between childhood and adulthood, and it can be a very confusing time. They really benefit from having someone in the school who they know they can trust to come and talk to if they need an ear to listen, or just need to take a break for a few minutes. I am hopeful that, by making these connections and helping students through the often muddy waters of high school, we are able to set them on the right path for a successful and happy future. What advice would you give to bachelor's counseling students who are on the fence about earning a graduate degree in the field? Well, my first piece of advice is that if you want to become a school counselor, you need to go to grad school! As far as I know, in every state you are required to have a master's in the field before being hired (definitely in Pennsylvania and most other states). If you have decided to pursue another profession, grad school still might be a good option, as most counseling and psychology jobs require a graduate degree or will require a degree if you want to go past entry-level positions. What does continuing education look like for you? We have a lot of flexibility with [what] classes we can take because our role covers so many areas. I have taken continuing education on classes such as gifted learners, anxiety, working with difficult students, working with difficult parents, suicide ideation, motivating students, and many others. There is almost no end to the classes that we can take because school counseling touches on almost every aspect of the school and the student's life. Although some school counselors choose to earn a doctorate in a related discipline, a master’s serves as the terminal degree in the field. You can bolster your skills by concentrating your studies in a certain age group or by specializing in areas like career planning or mental health counseling. Internships further build practical experience. The best online master’s in school counseling programs also prepare you to sit for licensing exams; all 50 states require school counselors to earn licensure. Online master’s programs serve as a flexible, cost-friendly alternative to traditional classrooms. You can access course materials, submit assignments, take exams, and communicate with your professors from the comfort of home. Current technology also enables you to study using a laptop, tablet, smartphone, or other WiFi-compatible device. For additional convenience, you can usually arrange internship accommodations close to home, eliminating the need to commute. Job availability with a master's in school counseling depends in part on your specialization and prior classroom experience (including internships). Additionally, some states require counselors to complete one or two years of post-degree work experience or earn a teaching license before sitting for a licensing exam. At first glance, many counseling programs seem fairly similar to each other. However, if you know what to look for, several factors can help you determine which online master’s in school counseling program fits you best. These factors include tuition costs, school location, program size, and program length. In the following section, we take a closer look at the impact of each of these four factors. First and foremost, students should look at accreditation when choosing where to enroll. If a school or program holds accreditation, it means that it meets a set of requirements set by peer institutions, the government, and related industry groups. Schools hold one of three types of accreditation: regional, national, or programmatic. Regional accreditation commonly applies to traditional brick and mortar colleges with four-year degrees. It serves as the most prestigious and sought-after credential by employers. National accreditation typically applies to online schools, distance learning programs, and vocational education. Programmatic accreditation derives from private industry groups who decide whether or not a program provides the education needed to succeed in a given profession. The Council for Accreditation of Counseling and Related Educational Programs (CACREP) accredits programs that lead to students becoming a licensed professional counselor or a licensed professional clinical counselor. The Department of Education (DOE) approves the CACREP. Two of the most important accrediting bodies are the DOE and the Council for Higher Education Accreditation (CHEA). The DOE does not accredit schools itself; instead, it oversees agencies that do offer accreditation. CHEA also recognizes regional and national accrediting organizations. CHEA is a nongovernmental agency run by higher education leaders. Learn more about which programs around the U.S. hold accreditation from the CACREP and other agencies. This may seem intuitive, but it bears repeating: cost matters as much as any other factor when choosing an online master’s in school counseling program, and students should not enroll in programs that they cannot afford. In many cases, online programs offer standardized tuition costs to online-only students. Oftentimes, this rate either mirrors in-state tuition or provides a cheaper per-credit total than out-of-state, on-campus tuition. Nevertheless, if programs do not offer this tuition and charge online students out-of-state tuition, attending an in-state school can sometimes offer a cheaper route. In most cases, tuition constitutes the bulk of what online students pay, as many online programs also provide online textbooks and resources. Nevertheless, some online programs charge a small, per-course online fee. Online students also can generally pursue the same financial aid opportunities as on-campus students, including FAFSA, grants, and merit and need-based scholarships. School location should also factor into a prospective online student’s decision-making process. Many online programs include at least a few in-person requirements, and some operate entirely through blended learning. As such, attending a local school can provide you with increased convenience in completing these requirements and with easy access to that school’s resources. Out-of-state schools make sense for online students who want a degree from a particular school or students who need to work full time while earning their degree. Before committing to a program, students should determine whether they want to work with a small cohort or with a large group. In most cases, a smaller cohort allows online students to both receive one-on-one instruction from their professors and get to know their peers. In many cases, smaller programs mean more involved assignments, including leading discussions, group projects, and case studies. Larger programs often involve forums and message boards as a means of communication and interaction. Generally, smaller programs maintain more stringent admissions requirements, as they offer fewer spots per cohort. Program length should also factor into a student's program selection. Full-time master’s programs often allow students to graduate within a year or two, while part-time programs often take three to five years. Part-time programs make sense for working professionals hoping to continue working while learning. Full-time programs cater to students hoping to commit all of their time to their studies and earn their degree as quickly as possible. Additionally, whether or not a program delivers coursework synchronously can affect program completion times, as set class times with peers often create accountability and support that keep students on track. Each online master’s degree in school guidance and counseling lists different requirements. Although many programs offer similar instruction methods, the specific curricula, graduation requirements, cost, and accreditation may vary. The licenses and certifications for which a graduate may qualify can also depend on the program. Many master's of education in school counseling online require fieldwork or on-campus components. The following table provides information about the different concentrations that students in an online master’s in school counseling can pursue. The table also highlights which careers graduates can pursue after earning these concentrations. Specifically, the table focuses on bilingual counseling, career counseling, and school counseling. Moreover, the table focuses on concentrations typically offered in online master’s in school counseling programs. Several similar programs award a master’s in counseling with a concentration in school counseling. Specific courses vary from school to school, though most programs offer a similar core curriculum. Below serves as a common list of courses in a master's in school counseling program. Counseling Techniques: From foundational theory to modern techniques, all master’s in school counseling online programs offer courses that teach the current best practices in the field. Students usually take more than one technique course during their online master’s in school counseling program. Assessment in Counseling: Assessment courses help counselors see the nonverbal warning signs of clients and ask the appropriate corresponding questions that help them. Assessment includes teaming with educators and administrators. Internship/Fieldwork: On-campus and online master’s in school counseling programs typically include internships and fieldwork. These exercises give students work experience before starting their careers. Crisis and Trauma Counseling: Many master’s in school counseling online programs feature courses on crisis management and trauma, and students can specialize in certain student groups. Ethics and Legal Issues: Ethical and legal restrictions in counseling protect students and counselors alike. Every student needs to take at least one class in this area to understand their rights and their clients' rights. Earning a master’s in school counseling online can vary in length and credit requirements. Counseling programs require anywhere from 30 to 60 credits to graduate. On average, students complete the program in two years. Many online master’s in school counseling programs run on a cohort or independent, accelerated format. A cohort program tends to take more time to complete but provides a more traditional feel. Through an independent program, students can take as many credits as they can handle. Most school counseling programs require internships and fieldwork, which can impact completion time. Some programs also include capstone projects or on-campus components. Licensure requirements vary by grade level and type of institution. Counselors must receive licensure in all 50 state in order to practice at public elementary and secondary schools. In order to sit for the licensing exam, candidates in most states must complete a set number of supervised clinical hours; master’s program internships usually satisfy this requirement. Some states also require one or two years of work experience or a teaching license. Counselors at private schools and college-level career counselors do not need a license. School Counselor in a State: License requirements vary from state to state. Make sure your program fits the criteria for the state you want to practice in. Many programs list state-specific restrictions. National Certified School Counselor: Awarded by the National Board for Certified Counselors, the NCSC proves that students meet the group’s standards. Counselors can earn the certification by applying, but they must hold a national certified counselor certification to do so. Some schools offer incentives for counselors to earn this certification. Graduates who leave school with a master’s degree qualify for dozens of school counseling jobs. That said, individual eligibility depends on the candidate’s specialization, licensure status, and other specific criteria. Below lists some of the most common career pathways for school counseling master’s graduates. Elementary School Counselors -- At the elementary level, counselors focus on fundamental learning and social skills. They routinely evaluate individual students for learning disabilities, behavioral disorders, and other issues that may hinder their education and development. Middle School Counselors -- In middle schools, counselors often help students address some of the physical and emotional issues related to early adolescence. They collaborate with teachers, administrators, and other faculty and staff to foster a supportive learning environment for students entering their teenage years. High School Counselors -- In high schools, counselors typically divide their energy between students who need support for emotional or social issues and those seeking advice about college or career planning. Larger high schools may hire separate counselors who specialize in each area. College Counselors -- Most colleges and universities maintain large counseling departments with personnel who specialize in different areas. Some offer mental health counseling and support for emotional or social issues. Others provide career guidance or assist applicants with the admissions process. Guidance Counselor -- Guidance counselors work in either middle or high schools, providing students with personalized advice on which courses to take. Guidance counselors must possess familiarity with each student’s preferences, long-term goals, and academic track record. Additionally, guidance counselors meet one-on-one with students to help them with behavioral or social issues. In addition to more favorable job placement rates, school counselors with a master’s degree enjoy higher earning potential. The BLS notes that the median annual salary for professional counselors with a master’s reaches $50,000. Compared to the median salary of $37,000 for counselors with a bachelor’s, master’s holders outearn their peers by 35%. According to U.S. News & World Report, the median annual salary for school counselors in the U.S. (regardless of degree level) reaches $53,370. The table below includes a thorough salary breakdown for school counselors. School counselor salaries vary depending on their area of specialization and work experience. The next table uses PayScale data to show the salary expectations for different school counseling roles at four career benchmarks. The table reveals that high school counselors and college career counselors follow the same basic career trajectory, with the same basic salary throughout their careers. That said, the salary for admission counselors at colleges and universities actually stops growing after about 10-15 years. The following chart provides information concerning the average salaries of graduates of online master’s in school counseling programs. The chart does not, however, take into account other factors that may influence a counselor’s salary, including experience and certifications. The table below features the top employing industries for professional school counselors in the U.S. As the table indicates, elementary and secondary school counselors represent more employees than the other four industries combined. According to the U.S. News & World Report, school counselors in the U.S. enjoy a relatively low unemployment rate, at 3.1%. Additionally, the BLS projects a 13% growth rate -- roughly 36,700 jobs -- through 2026. This rate stands higher than the projected 5% growth for all industries during the same timeframe. However, education budget cuts at both the state and federal levels could mitigate any projected growth. Additional BLS data reveals that professional counselors who hold a master’s degree outnumber their bachelor-holding counterparts by nearly two to one. The high number of master’s-holders creates a competitive job market for school counselors. Students who earn master’s degrees from top online programs enjoy a decided advantage. Students need to make professional connections and learn about different approaches to school counseling. Professional organizations offer a great entry point for students who want to learn more about their chosen career path. Below you can find four of the country’s most prominent school counseling organizations. These organizations host networking events, provide online trainings, maintain active job boards, and offer other services for career-ready college graduates. Resources like these often prove invaluable as you complete your degree requirements and enter the job market. American School Counselor Association: The ASCA is a national association for school counselors working at all education levels. Member benefits include discounts on professional development courses, complimentary liability insurance, and a free subscription to two online publications. American Counseling Association: Founded in 1952, the ACA boasts more than 56,000 members and is the largest organization representing professional counselors in the world. The website includes an online resource library, government publications, a career center, and links to continuing-education opportunities. International School Counselor Association: The ISCA works in international schools across the globe. It offers both individual and organizational membership and hosts an annual conference each year. National Education Association: The largest professional organization of employees in the country, the NEA states its main goal as "advancing the cause of public education." The organization includes three million members who work at educational levels ranging from preschool to college. The NEA offers lesson plans, grants, annual conferences, and advocacy to its members. Individuals who eventually want to teach other school counselors should consider completing a Ph.D. program in school counseling. Upon completion of a Ph.D., graduates can work as professors at universities, helping to shape the next generation of school counselors. The primary differences between a Ph.D. in school counseling and a doctor of education (Ed.D.) in school counseling lie with curriculum focus and professional outcomes. As mentioned aboves, Ph.D. graduates usually continue teaching, often mentoring school counseling graduate students. On the other hand, Ed.D. graduates often begin performing research, aiming to advance the school counseling profession on a macro level by conducting studies and publishing academic papers. As such, a Ph.D. program curriculum focuses more on teaching while an Ed.D. program curriculum focuses more on research. While requirements vary from state to state, the licensure renewal process for school counseling includes certain commonalities. In most states, school counselors can renew their licenses for five or six years through continuing education and professional development -- and by completing a certain number of work hours in a school. As an example, the next two paragraphs list the procedures for school counselor licensure renewal in Arkansas and California, states in which requirements closely resemble those of other states. 1. Work in a school the previous year. 2. Work in a school two of the previous five years. California (Five Years): All applicants must complete 150 hours of professional development activity and six months of professional experience. Despite the relative affordability of accredited online school counseling master’s programs, most students still need financial assistance. Students should complete a Free Application for Federal Student Aid (FAFSA) form to learn more about loans, grants, and other opportunities offered through the U.S. government. Additionally, nonprofit organizations, companies, and other sources offer private grants and scholarships. Check out our collection of resources below to learn more about financial aid options. Approximately two-thirds of today’s college students rely on loans to fund their education. Other options, however, abound; so, students should make sure to review all of their choices. Completing the FAFSA is a crucial first step for any student with financial needs. Our FAFSA guide features a step-by-step rundown of the process and answers to several frequently asked questions. Online and on-campus students typically enjoy the same financial aid options. Click the link to learn more about different funding opportunities available to online students. Online programs can provide an affordable and flexible option for women trying to balance the demands of work, family, and earning their degree. Students can view scholarships geared specifically toward women. Online college programs serve as a flexible, affordable option for single parents interested in earning a degree and securing their family’s financial future. This list of scholarships, grants, and other financial aid options caters to single moms and dads.